Maltese and Israeli officials will cover for the loss of two referees from Portugal on Friday night. Maltese officials will now take charge of Hibernian's SPL game with St Johnstone on Saturday, after the Portuguese referee scheduled to be at the match pulled out on Friday night. Chris Lautier and his assistants, Philip Agius and Joseph Camilleri, were originally due to referee the Scottish Cup replay between Beith and Airdrie United. After a 9am pitch inspection, Beith's game was postponed, paving the way for the Scottish Football Association to shift the trio to Easter Road. Their fourth official will be Scottish assistant referee Andy Tait. Portugal's Cosme Machado was down to referee in Edinburgh but he flew home on Friday evening, having learned on his arrival in Scotland about the current walkout of Scottish officials. His countryman, Joao Ferreira, was given the Motherwell versus Hearts fixture on Sunday. 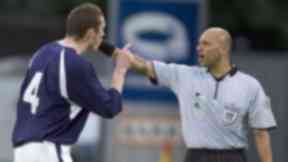 That match will now be refereed by Israeli Meir Levy, who will also take charge of Hamilton v St Mirren on Saturday. Curiously, despite one of the Portuguese linesmen being pictured leaving Glasgow Airport with Machado on Friday, the SFA have announced that both Luis Ramos and Inacio Pereira will still run the line at Fir Park.